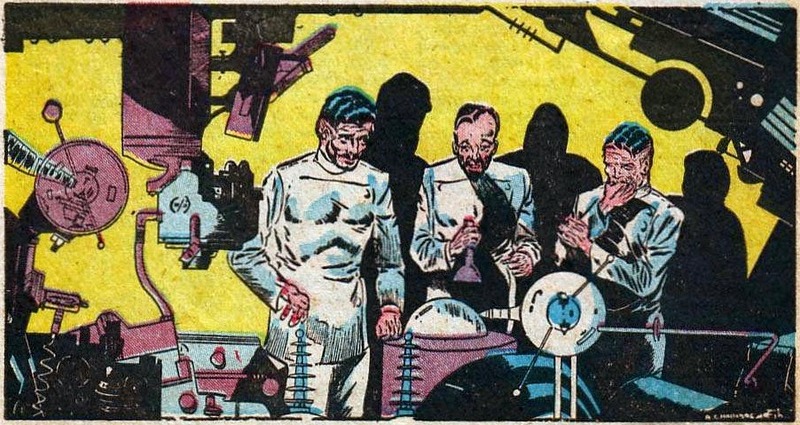 The Golden Age of comic books stretched from the 1930s through the 1950s and overlapped with a time of unbridled optimism about the progress of science. People wanted to know about how the latest technology worked, and LOTS of people wanted to read comic books, so putting the two together seems like a no-brainer. Golly wilikers! Who wouldn't wanna learn how atomic energy works from a man in a fedora?! In all seriousness, this Bill Cosmo character is a bit over eager to tell little Johnny more than he actually knows. His explanation of nuclear fission is pretty muddled, his metaphors don't make a lot of sense and he has a hard time telling the difference between weight and mass as well as speed and velocity. He claims to work in a physics lab, but I have my doubts. In the heady early days of the atomic age, nuclear power seemed like it was going to change everything. However the race to explain how this new technology worked was hampered by the fact that in 1946 everything was still so new and a lot of information about nuclear technology was still secret. 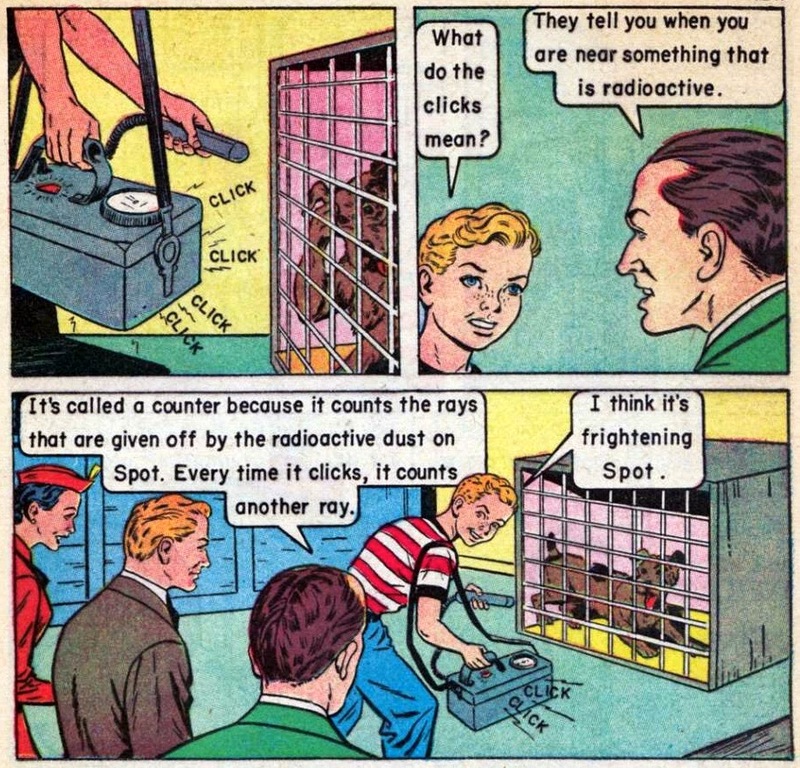 "How Atomic Energy Works" appeared in the Summer 1946 issue of Future World Comics. Page 41. Apart from splitting the atom, radar was the other, big physics breakthrough of World War II. It let pilots see in the dark, and was instrumental in turning the tide of the war. 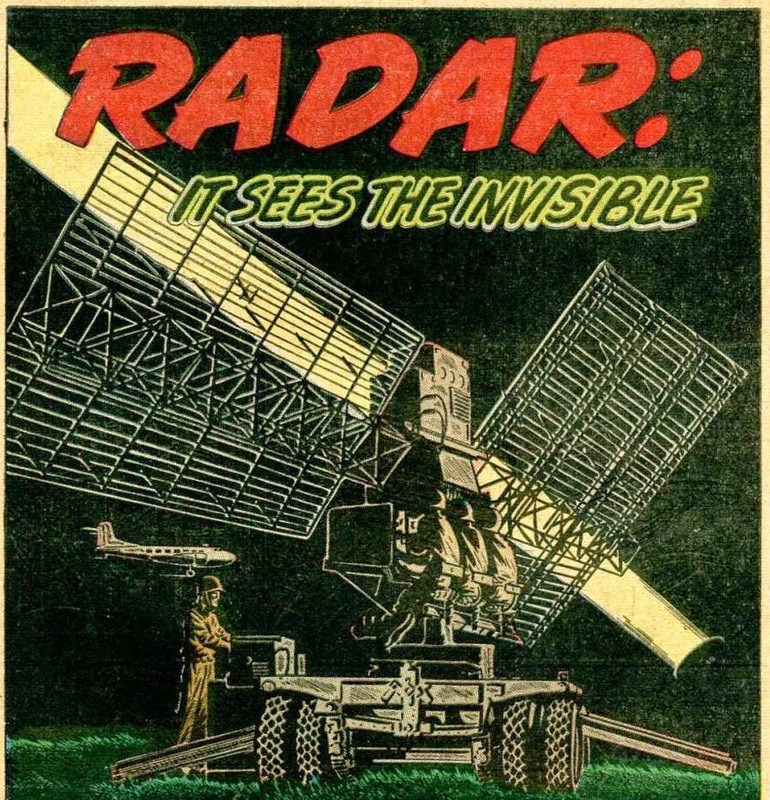 "Radar: It Sees the Invisible" is actually a pretty good, no frills rundown of how pilots use bouncing radio waves to see. When the comic was published in March of 1946, it was another military technology transitioning into peacetime use. By the time 1948 rolled around, it seemed like people started to "get" nuclear energy. General Electric published their "Adventures in Science" series to highlight the work they doing to develop telephones, power generators, lightbulbs, aerospace technology and of course, nuclear energy. All together, GE produced 68 million comics over the entire series run. They're well done too, with imaginative illustrations and creative analogies. 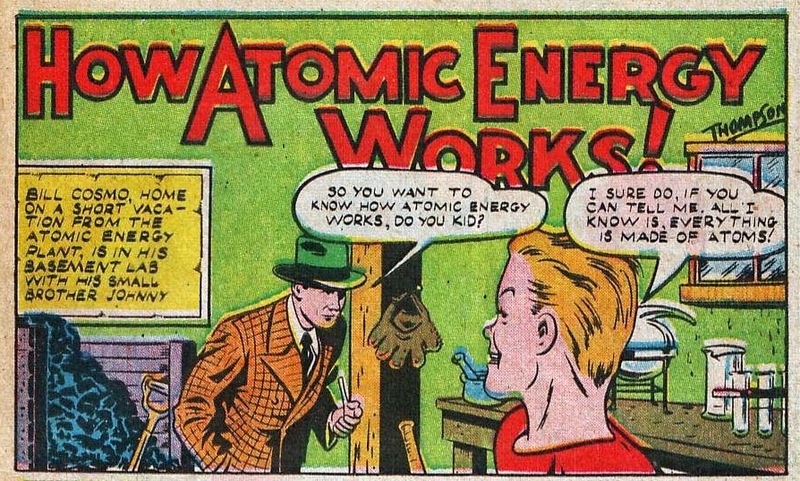 In "Adventures Inside the Atom, the prototypical Johnny is eager to learn all about how fission works, and Ed here seems to know quite a bit more about the process than the aforementioned Bill Cosmo. He takes Johnny on a tour from the prognosis of atomic theory in ancient Greece, to the atom-powered world of tomorrow! It's a pretty solid introduction to nuclear energy, plus bonus points for recognizing the often overlooked contributions of Lise Meitner to fission's discovery. 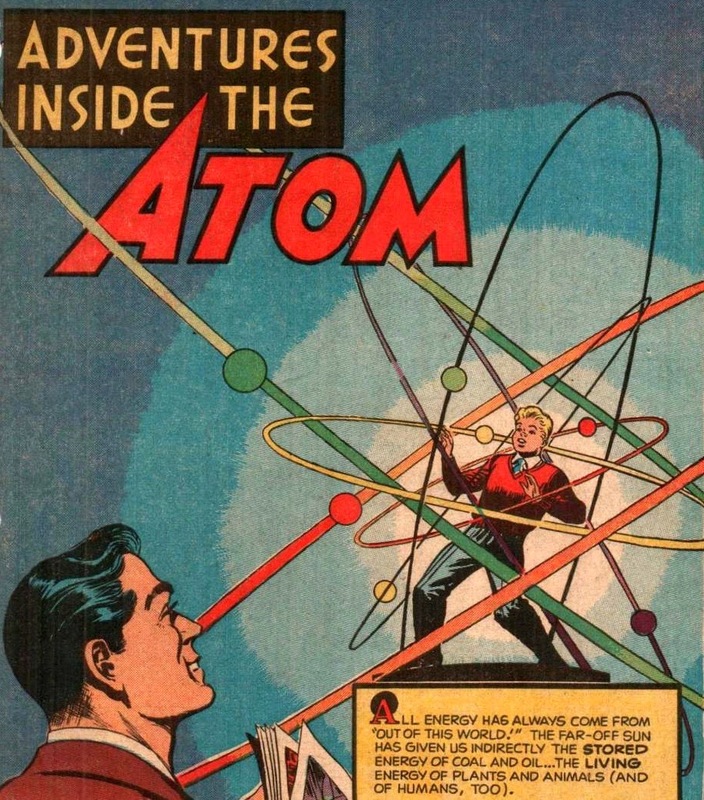 Adventures Inside the Atom was a standalone comic published in 1948. 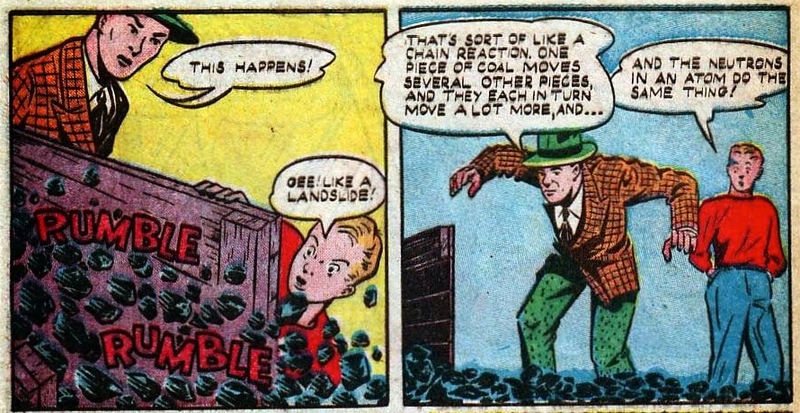 I know I'm always ready for a science lesson after dispatching the nefarious plot of a brawny murderer. In "How Sonar Works," adventurer Jack Boyd takes some time to explain to the salty ol' cap'n how that newfangled sonar technology works, following a harrowing treasure hunt. Actually, seeing the ocean floor using bouncing sound waves was invented around World War I, but hey, it's never too late to learn. 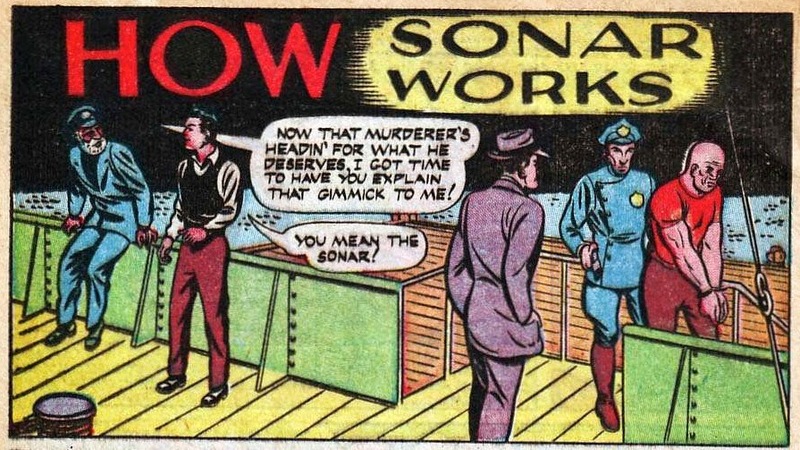 "How Sonar Works" appeared in the fall 1946 issue of Future World Comics. Page 28. More General Electric goodness, except this time Johnny and Ed are exploring the science of electricity and how industry (read: your friends at General Electric) harnesses it. After little Johnny almost electrocutes himself, Ed takes him around the world to learn how magnets induce electrical currents, and the many ways that energy gets converted into electricity. This time, Ed's got some help in the form of an army of tiny, friendly, anthropomorphized electrons. Illustrator George Roussos drew a bunch of GE's "Adventures" series, only some of which are available on Comic Book Plus. In an interview in 1983, he said that at the time "Comics were selling so good it was obvious that children would rather read them than their school books so someone had the idea to do comic books about electricity." 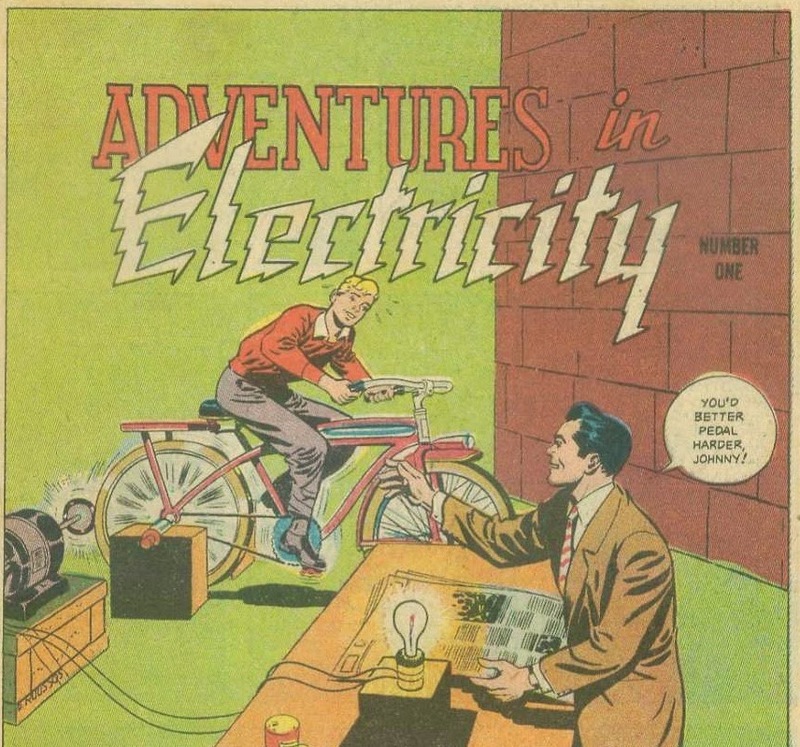 "Adventures in Electricity: Generation" was published in 1946. This may be the outright weirdest of the bunch. 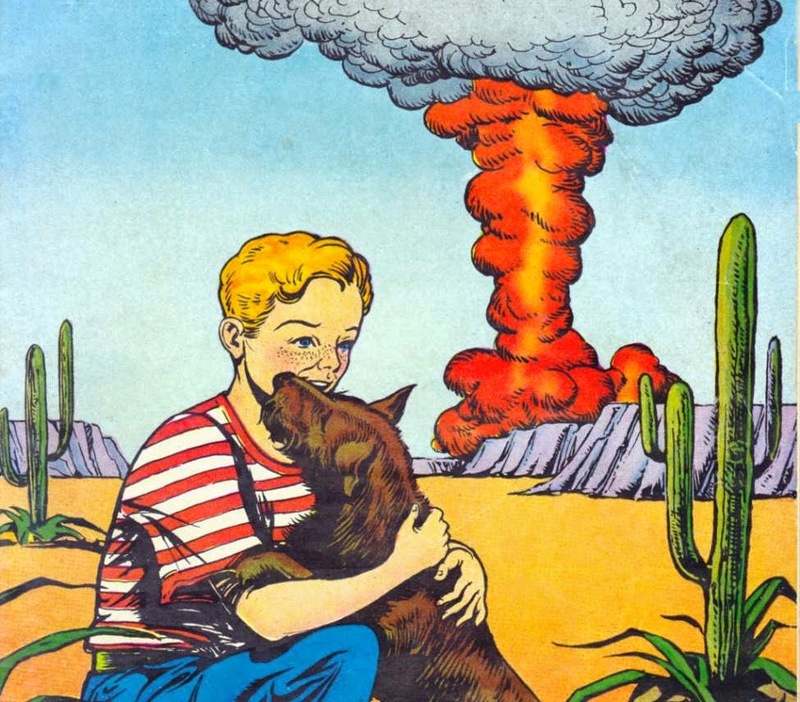 Andy loses his dog around the atomic bomb proofing grounds in Nevada, which is possibly the worst place in the world to lose your dog. When the army finds the pooch, they take little Andy on a tour of the top secret weapons facility and tell him a little bit about radiation. Apparently, if your dog is covered in radioactive fallout, don't worry, everything will be fine in a week. "Andy's Atomic Adventures" took up the whole September 1953 issue of Picture Parade. This one's downright cool! It's the real life story of smuggling Nobel laureate physicist Niels Bohr out of Nazi-occupied Denmark in 1943, followed up by the British and Norwegian secret mission to blow up a critical part of the German's atomic bomb program. I had no idea that his escape was as harrowing as it was, Bohr almost died of asphyxiation while hiding in a British airplane's bomb bay! Fair warning though, there are a couple of fist fights and shootouts in it that didn't actually happen; It is a comic book after all. It's a bit light on the science, but action packed and a great read. 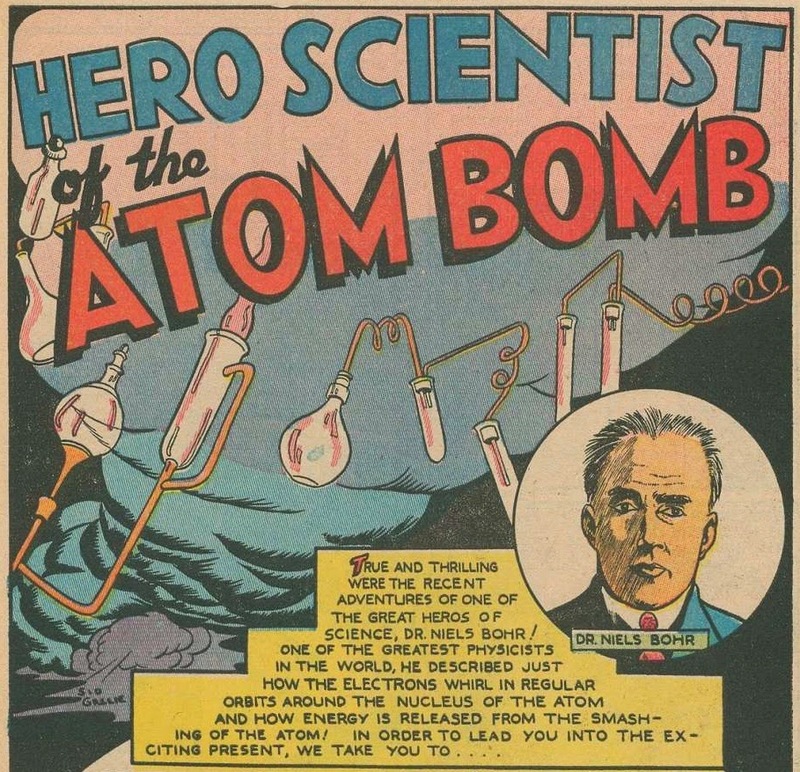 "Hero Scientist of the Atomic Bomb" appeared in the March 1946 issue of Marvels of Science. Page 7. Very happy to see science adventures in comics, i love this. Thanks a lot for sharing!